Sauté the onion and peppers for 2-3 minutes until the onion is translucent. Add beef and garlic, and cook until the meat no longer looks red. Season with ground cumin and salt, to taste. Add tomato puree, tomatoes and water. Cover the frying pan and lower the heat. Let simmer, stir occasionally and let cook for 15-20 minutes, or until the meat is completely cooked and tender. Serve about 3 spoonful's of beef inside the warm tortillas. Garnish with cilantro, onions and lemon. Enjoy! For Day of the Dead celebrations, we usually make an altar and decorate it with paper, candles, campesuchil flowers and food offerings, such as the traditional pan de muerto, sugar skulls and the favorite dishes of our deceased loved ones. 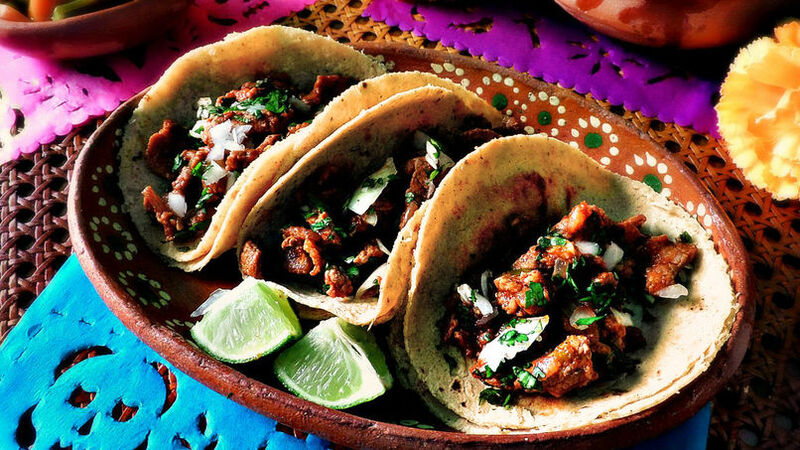 Traditional dishes like mole, tamales and stuffed chili peppers are also very popular food offerings, as well as tacos. My grandfather loved tacos! His favorites were beef tacos, which he used to make with onions, tomatoes and green chili peppers. I make that dish every year for Día de Muertos in memory of my grandfather. Try making this dish that can be prepared for any type of celebration or on a regular day so you can enjoy its delicious flavor any day of the week.